By installing AIST-MeRAM on your computer, you can perform assessment with only a few mouse clicks – ranging from Hazard Quotient risk assessment to high level risk assessment using species sensitivity distribution and population-level effect models. 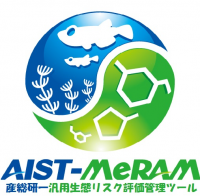 AIST-MeRAM contains not only these assessment models, but also toxicity test data on approximately 3900 substances and the emission factors of chemicals under CSCL (Chemical Substances Control Law of Japan). You can thus use the tool even if you don’t have data at hand or expertise in ecological risk assessment and statistical analysis. Good news for users of ASEAN countries, we are preparing multilingual operation manuals such as Chinese, Thai, and Vietnamese. please stay tuned.